ରାଷ୍ଟ୍ରାଦର୍ଶ : "Desire the Right"
↑ ୧.୦ ୧.୧ "Falkland Islands Census 2012: Headline results" (PDF). Falkland Islands Government. 10 September 2012. Retrieved 19 December 2012. ↑ ୨.୦ ୨.୧ "Falkland Islands (Islas Malvinas)". Central Intelligence Agency. Retrieved 10 July 2013. L.L. Ivanov et al. The Future of the Falkland Islands and Its People. Sofia: Manfred Wörner Foundation, 2003. Printed in Bulgaria by Double T Publishers. 96 pp. ISBN 954-91503-1-3. (Spanish) Carlos Escudé and Andrés Cisneros, eds. Historia de las Relaciones Exteriores Argentinas. Work developed and published under the auspices of the Argentine Council for International Relations (CARI). Buenos Aires: GEL/Nuevohacer, 2000. ISBN 950-694-546-2. Thoughts on the Late Transactions Respecting Falkland's Islands by Samuel Johnson, 1771. Greig, D.W. Sovereignty and the Falkland Islands Crisis. Australian Year Book of International Law. Vol. 8 (1983). pp. 20–70. ISSN: 0084-7658. César Caviedes. Conflict Over The Falkland Islands: A Never-Ending Story? Latin American Research Review. Vol. 29 (1994) No. 2. pp. 172–187. Falkland Islands Government (official site). 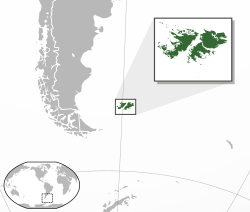 Falkland Islands Development Corporation (official site). Falkland Islands News Network (official site). "Historical Dates". The Falkland Islands Government. Retrieved 17 March 2011.